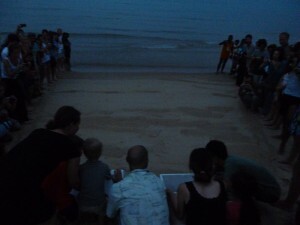 We have been operating a sea turtle conservation program in a small village on Tioman Island. The village, Kg Juara, is fast becoming tourism oriented and moving away from other means of income like farming, fishing, and rubber-tapping. Issues that have caused the local and world-wide decline in sea turtle populations are the same issues faced all around the world, everywhere there are sea turtles and people. Since we live here on Tioman, where sea turtles also live, it is our goal to try and conserve this area as a healthy nesting area for the them. Our approach started by taking for granted the idea that all people wanted to help the sea turtles, and in turn help their tourism economy over the long run by having a healthy beach, reef, and tropical ecosystem. We talked locally about biodiversity and how the sea turtle species are going extinct around the world, thus making Kg Juara a special and important location for them. While many people agreed with these ideas and points, the practical application of conservation was often lost, and or the unfortunate, but totally understandable, desire to develop more overruled ideas on saving nature for the future. We ran into some flaws by promoting conservation strictly based on biological and preservation reasons and decided to try some other tactics. For instance, if the needs of biodiversity do not resonate with someone operating a resort, then perhaps we aught to try speaking more in line with their interests of profits. With these ideas we began promoting how helping turtles can help business, how much tourists like sea turtles, and how helping to preserve a nesting beach is also like preserving a economic asset for the future. There are even statistics out there on how much one turtle is worth to the tourism industry, creating revenue from snorkel trips, diving, location promotion, general interest and more. 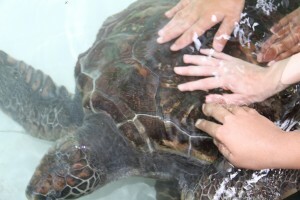 Additionally we started a very simple sea turtle nest sponsorship program. Traditional egg-collection, which is still legal in Malaysia, creates some income for the one family who is doing the collecting and selling. We however, can pay for the nest to be collected and brought to out hatchery and then begin to generate exponentially more revenue from it over the two months that it lays incubating. We create revenue from our specific nest sponsorship programs, tourist information tours, volunteer involvement programs, and from supportive organizations. That revenue is all based on interest and support for the eggs being collected, protected and put in the sand to hatch, instead of being sold or eaten. So where traditional egg collecting can create limited income for one family, through conservation we can generate far more income and spread it among far more people. The recipients of our income include the three local families working with us, the family we rent land from, the government to whom we pay taxes, two full time Malaysian marine biologist staff, one foreign worker, quite a few assorted school and village functions, and as many locally contract workers as we can make projects for. When a turtle egg in the market is valued at about MYR3, we can estimate a protected turtle egg is currently creating about MYR25 each, and of course a protected egg is also creating more sea turtles! However, either the pockets of conservation are not deep enough, or our organization is not adept enough, because the sea turtles are still loosing literal ground on which to come and nest. The income generated and spread around by nest protection does not compare to the potential income generated by a two story hotel with beach side pool and bar, and everybody seems to know it. 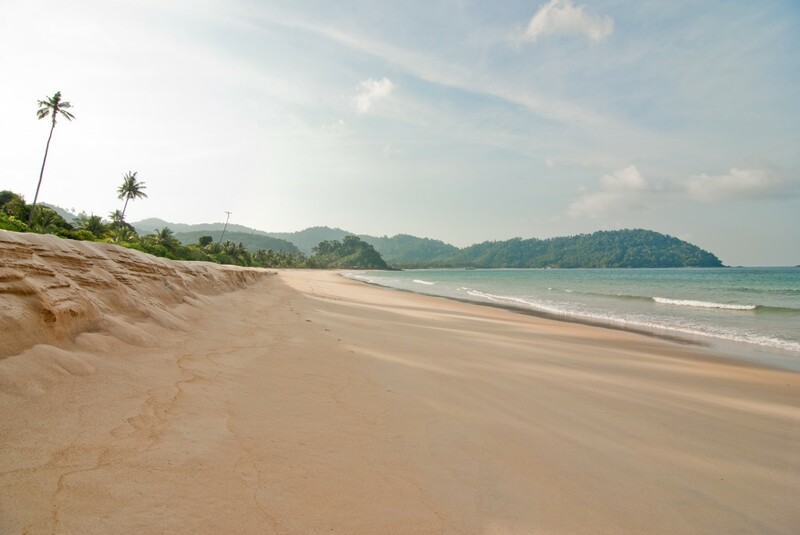 Natural beach is becoming more scarce here on Tioman, as are the turtles in the sea becoming more scarce due to ongoing threats such as trawling nets, pollution, and global egg-collection. As we continually restructure our approach here on Tioman, we have realized the importance of highlighting and promoting biological aspects of conservation as well as appealing to financial. While conservation and nature preservation can be healthy economically and socially, many tourist areas with now wasted ecology still have very prosperous tourism economies. While the success of a conservation effort may likely be determined by profitability, the benefits of conservation itself cannot be totally quantified within the ideals of profits. For better or worse, it already doesn’t look like this anymore. Next Next post: Nest Sponsorship!